Quarterback Ryan Tannehill is officially out again for this week’s game against the Jets, Dolphins coach Adam Gase announced on Wednesday. Gase added that Tannehill has been throwing with trainers and the option of surgery on his injured shoulder has not yet been discussed. The Dolphins remain hopeful that Tannehill will return at some point this season, but there’s no definitive timeline for his return either. Sunday’s absence will mark Tannehill’s fourth consecutive missed game. Tannehill’s ongoing issue could impact his future with the Dolphins beyond 2018. His status with the team in 2019 is “not settled,” according to Armando Salguero of The Miami Herald, who hears that the QB has not lived up to the expectations set for him before the start of the season. 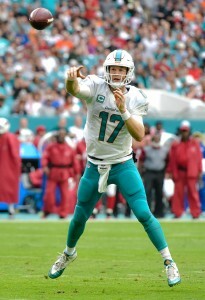 In five games this season, Tannehill has thrown for 972 yards, eight touchdowns, and five interceptions. Without Tannehill, the Dolphins will turn to Brock Osweiler once again. Although Osweiler showed flashes of what made him such a valued free agent a few years ago, he was unable to deliver against his old friends in Houston on Sunday. Osweiler completed just 21 of 37 passes for 241 yards with zero touchdowns and one interception as the Dolphins lost 42-23 to the Texans. Adam Gase is desperately hoping that throwing Tannehill under the bus will buy him another season on the sideline. Should’ve never gotten rid of Suh and Jarvis Landry. I second this! Also, “offensive genius ” Gase should be packing his bags. They had a chance to trade up last year. The need is even greater now but the crop of prospects much weaker. Poor management. Below average quarterback and below average coach, same old same old in Miami.